Even though the big five TV networks will not be having their official upfront presentations until next week, there has been a ton of breaking stories coming out this week about which shows are coming back and which are goners. Tonight, I received some good news and some bad news. 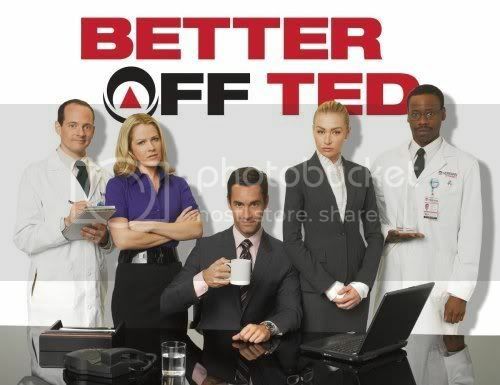 The bad news first, ABC officially canceled Better Off Ted. I know that not too many people checked out this quirky, workplace satire (obviously), but it was ten times better than The Office. To be honest, I wasn't shocked that BoT was axed, and I was happy just to get a second season. Part of me was holding on to hope that some other channel, FOX or FX, would swoop in and save it, but I always knew that was a long shot...which brings us to the good news. NBC is apparently going to give us Chuck fans a 13-episode fourth season. Now, I'll be the first to admit that I was not expecting a pick-up after the Chuckpocalypse and falling ratings, but industry insiders had more faith in the show's chances, which is why I don't get paid to write about TV shows. While I'm a little surprised by the pick-up, I'm also really jazzed about getting some more stories about our favorite Nerd Herder/Intersect/Spy. Although, I kind of want season 4 to be the last season. We Chuck fans have been extremely lucky, and I'd rather have a set end date than risk an open-ended series finale. Plus, shows tend to start going down hill around season 3 or 4 anyway.